The focus of this special edition of Youth Studies Australia is on questions, issues, challenges and (tentative) solutions in relation to ensuring that research with young people is conducted ethically. 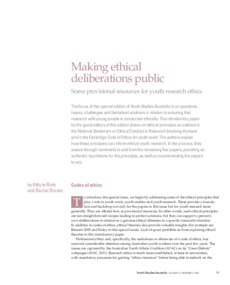 This introductory paper by the guest editors of this edition draws on ethical principles as outlined in the National Statement on Ethical Conduct in Research Involving Humans and in the Fairbridge Code of Ethics for youth work. The authors explain how these principles can inform ethical youth research. In the process, they weave through comments to and from the remaining !ve papers, providing an authentic touchstone for the principles, as well as recommending the papers to you.